He had asked me to make a card for his youth group leader and a Santa Chocolate bar. For the card I used my Distress Inks to create the background, the Santa and the houses were cut using my Cricut. 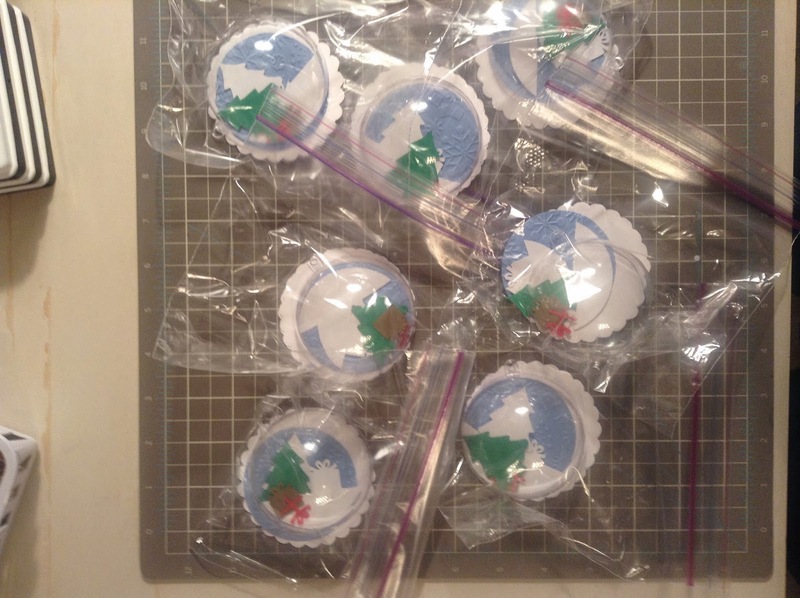 I used the Christmas cartridge for the Santa's sled and the Winter woodland cartridge for the houses. I layered some white paper that I ripped along a curvy ruler to create the snowy layers, some silver Color Box ink and a star stamp to finish off the card! Ho Ho Ho - Santa Card!! The Cards are Ready to Mail!!! I have my pictures ready and organized so I think that I will print all my pictures that I have taken so far. This week has just flown by... It is hard to believe that we are going into our second week of December already!!! All we need now is some snow!! Over the last few weeks I have been working on making my first December Daily. If you're not familiar with what this is, it is a scrapbook with at least one picture for every day in December. I'm just about done making it and I have taken all my pictures and organized them into a folder in my pictures. I thought this would make it much easer when it is time to send them off to be developed. It would save me the time of going through everything and trying to remember which picture was for my December Daily. I think that I would have been done making it by now but as soon as I was ready to put everything together I changed my mind on how I was going to number each day!!! I have since gone with a much simpler number design and have decided to use lots of embellishments on each page instead. Today I had a fun crafty moment with my youngest son Nathan. He went to a birthday party this afternoon and before he went we made his friend a birthday card. We personalized the inside of the card and the envelope, for the front I cut out this cute little doggie from Create a Critter Cricut cartridge and then embossed the blue background paper and the back of the envelope with the Happy Birthday Cuttlebug Embossing folder. The paw print and the sentiment are from the My Pink Stamper Even More Punny-licious stamp set. I cut everything out and Nathan helped with the rest!! It was a lot of fun!! I hope that you have had a great weekend!!!! Tomorrow night is Kids Club night at our church and I am a leader of the older girls group. Our group loves crafting. Anything with glitter, glue, paper, painting and ink our group loves to do it!! 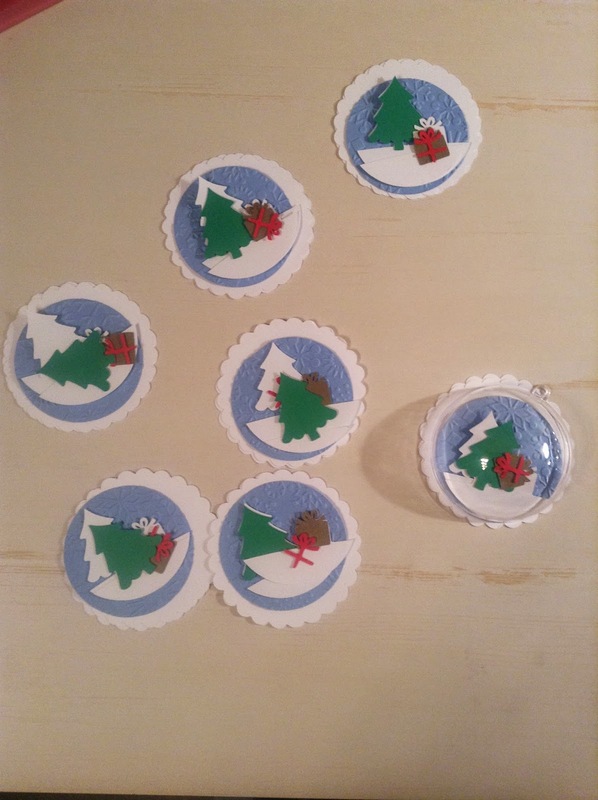 With Christmas right around the corner, I have been planning lots of fun crafts and tomorrow's craft is one of my favourites!! I was inspired by the Papertrey Ink Christmas tag kit for this week's craft. 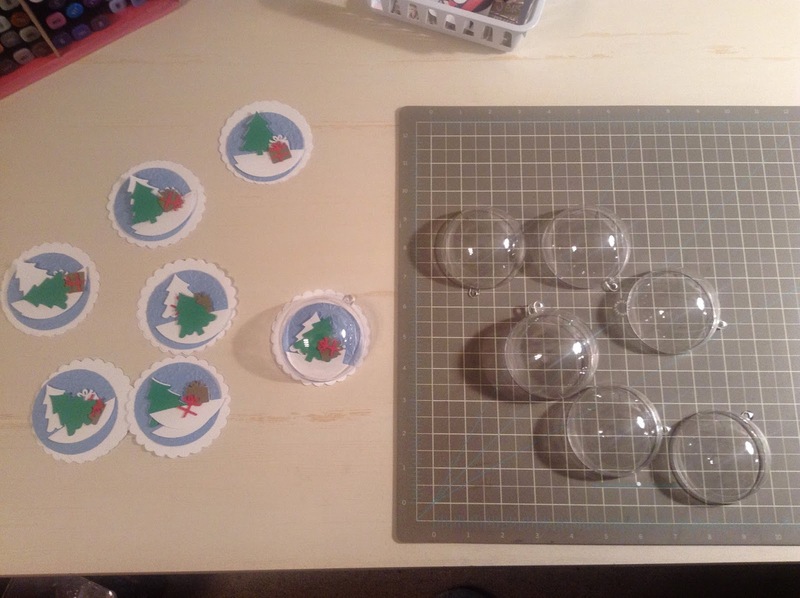 We are going to make some ornaments with a cute Christmas scene inside. I will try to post a finished ornament tomorrow night!!! With today being the first day of December it is time to pull out the holiday mugs :) I have a new mug to add to my collection today, the new candy cane mug from David's Tea. My sweet husband surprised me with it tonight and some Santa's Secret black tea to go with it!! This was such a nice surprize... this is my third year in a row getting a new holiday mug from David's Tea and this is such a cute one to add to my collection!